It’s me, Beatrice! I’m on the blog so it must be Monday. 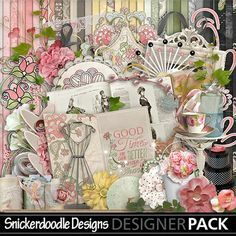 Today I’m showing you inspirational layouts using Tell Me Again Collection by Snickerdoodle Designs and ADB Designs. This Kit / Collection has been moved to Attic Treasure, at The Digichick and SnickerdoodleDesigns. That means it is available at an unbelievable discount! Save 79% on the Collection! That means you can get this $27.92 Value for just $6.00! Or if you only need the Kit, you can get it for $2.39. You’ll find this Collection at Snickerdoodle Designs or at The Digichick in the Attic Treasures Section of each shop. I love the theme of this collection, for who doesn’t recognize the fact that beloved stories need to be repeated over and over? I found many gorgeous layouts using this collection but I’ve chosen just a handful to show you here. The photo in this heritage layout by Chickie is a treasure. I like the way she retained the deckle edge in keeping with the era of the photo. The pieces stacked behind make for the perfect foundation. 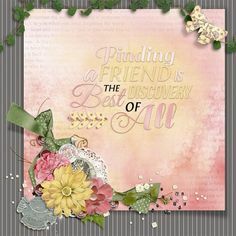 The clusters are large and beautifully shadowed and the background paper with overlaid text supports the theme. The blue stitching frames the layout and really pops against the neutral background. The design in this layout is very creative. The photo is lovely, especially as framed by the half-circle paper and cascading element cluster. The artist blended the kit papers to create her original background. The title work is delicate in keeping with the overall look of the page. 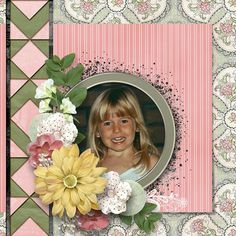 The embellishments and photos are, for the most part, placed toward one side of the page which adds interest to the layout. I like the way the artist duplicated and resized the photo, a clever trick when you only have one photo to scrap. She was able to hide the antique auto on the paper by covering it with the shutter and chair which also work as a foundation for her photos. I like the way the vine at the top moves the eye horizontally while the cluster walks us down the page vertically. I found another amazing heritage photo in this layout by Kabra. The triangular paper pieces work to point the eye to the photo, just as arrows would. She created the points in the striped paper by rotating and abutting the edges together. The cluster at the bottom edge of the photo is large and perfectly shadowed. I like the way the green flower pops and the way she tucked in the key and pen. 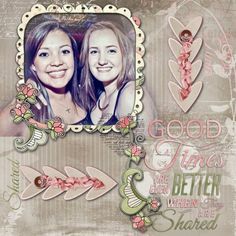 I’ll finish my post by showing you this layout by Renee. She combined a single photo with a cropped piece from one of the kit papers and another from one of the kit cards. By keeping them the same size as the photo they work perfectly to supplement the photo on the page. Masking one of the solid papers in the center permits the text of the song lyrics to stand out. The vertical cluster is outstanding. I like the way the ribbons and papers support the cascade of flowers. The smaller cluster in the opposite corner helps us to take in the entire page. Here is a gorgeous cluster to help you get started with your own Tell Me Again pages! I hope you have found these layouts inspiring. I know you have your own stories to tell again and again so I’m optimistic that you will find some time for creating this week. Thanks and make it a great one.